Cookies, pudding, milk…no this isn’t a glance inside your kids’ school lunch box. 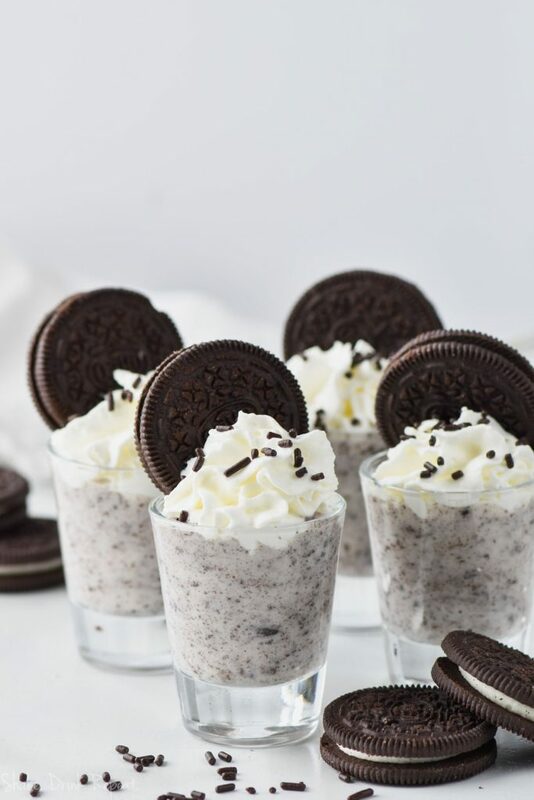 This, my friends, is how you make Cookies and Cream Pudding Shots, one of the tastiest little cocktails you’ll try this summer! 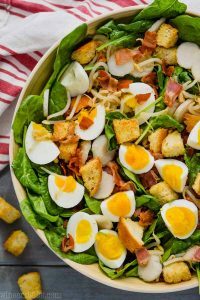 Time to take some of those childhood favorites and give them a grown-up makeover. Much like its cousin, the Jell-O shot, pudding shots are versatile, easy to make, and can be packed up easily for on-the-go summertime fun. These Tiramisu Pudding Shots or Mint Julep Jell-O Shots are yummy options. Or for special occasions, whip up a batch of my delicious Birthday Cake Pudding Shots! WHAT DO I NEED TO MAKE COOKIES AND CREAM PUDDING SHOTS? Mixing cookies and cocktails is so very tasty (Samoa Martini, Cookie Butter Milkshaketini, or Sugar Cookie Martini anyone?) and this pudding shot recipe does not disappoint! Creamy pudding, cake vodka, a little milk and some Oreo cookies make these the perfect spiked treats for sharing at picnics, pool parties, or patio visits. HOW DO I MAKE COOKIES AND CREAM PUDDING SHOTS? Combine the pudding with one cup of milk and about half a cup (or so) of cake vodka. Stir in some crushed Oreos for extra cookie crunch, then put the mixture in the fridge for at least an hour until it’s nice and thick. 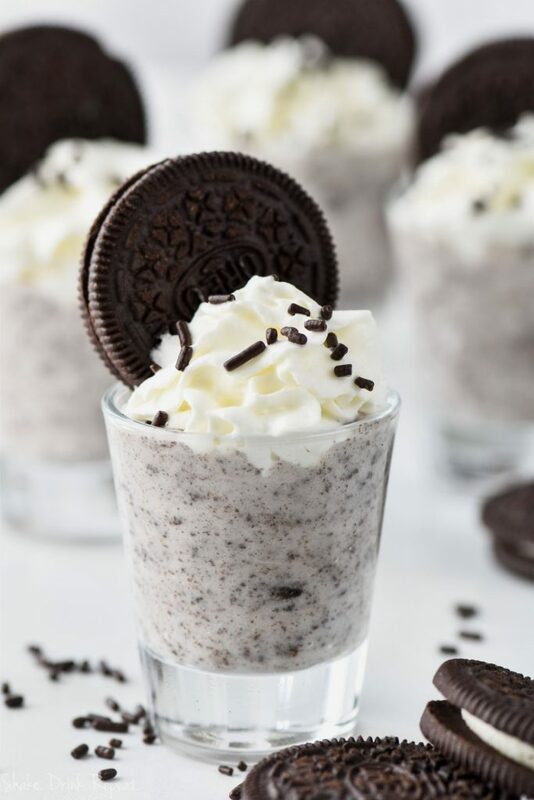 Get that delicious cocktail in some shot glasses and top with whipped cream and more Oreos. 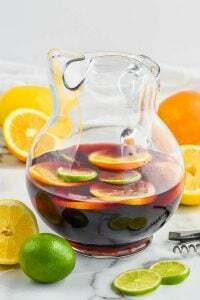 I promise you, this will become one of your go-to party cocktails this year. 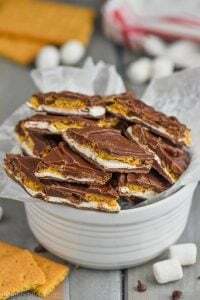 Double the batch to share with friends! 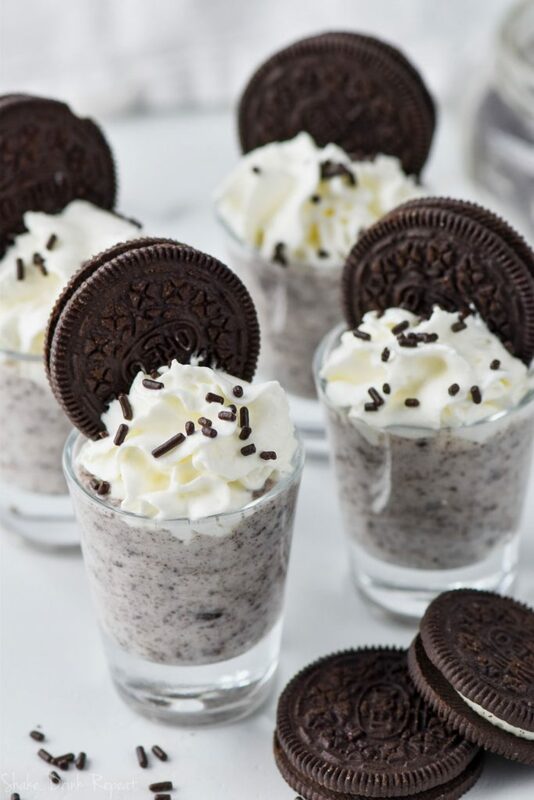 These Cookies and Cream Pudding Shots are so easy and so delicious! Made with vodka but taste like a cookies and cream milkshake! Whisk together the pudding mix with the milk and the vodka and then stir in the crushed Oreos. 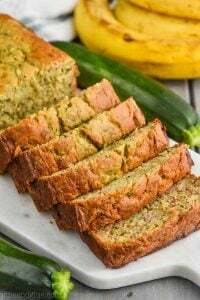 Refrigerate for at least an hour or until it thickens up. 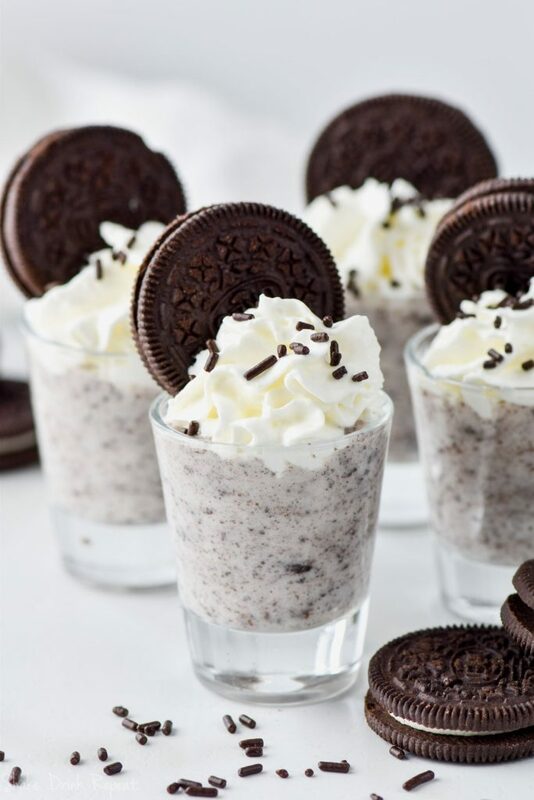 Serve in shot glasses topped with whipped cream and Oreos!